Your laptop basically goes everywhere with you – it houses all of the information that's important to you and sometimes you might even feel naked without it. So don't you want to treat your laptop as if it's a part of you, perhaps as an accessory to your ever-so-fashionable self? It's time for you to get started on pimping out your laptop. Dress it up with some of these awesome accessories to not only show that your laptop is something that's important to you, but also to express some of yourself and your personality in your closest piece of technology. You can have a pre-made design or even a custom design that you've created etched or engraved into the casing of your laptop. While it is a permanent addition to your precious piece of technology, it gives a really cool texture and look to an otherwise boring laptop backing. You can engrave anything from simple words or names to intricate full-cover designs. The possibilities are endless. Skins are simply decals that stick to the backing of your laptop, so they're the not-so-permanent option for those of you hesitant to have your precious laptop engraved or etched. Skins are generally less expensive, too, and can even be printed out right at home. Check sites like SkinIt.com to find a design you like, or submit a custom one. If you have a skin made from your own design, you'll have the luxury of knowing that you're the only one in the world with that particular skin. 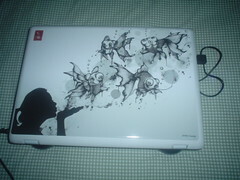 Show off your artwork or doodles every time you open your laptop with a custom skin. If you don't really like the look of a whole laptop covered in a design or skin of any sort, try looking into some custom decals. They're usually just small designs that you can place anywhere on the backing of your laptop, and since they're smaller, they're even cheaper than skins! There are some really creative vinyl decals out there that take advantage of the Apple logo on the back of Mac products and even some that take advantage of the built-in designs of Dells and other manufacturers. Shop around (check Etsy for some ideas and designs), find a decal or two or three that you like, and change them up as frequently as you want on your laptop! If you have an external mouse for your laptop (which, if you don't, what are you waiting for, exactly? ), browse through the endless options of custom mouse pads, or again, have a design of your own created. There are tons out there that show personality, so choose something that totally suits you and tote it around in your laptop bag everywhere you and your trust machine go. OK tech nerds, this one's for you. There are so many cool accessories that you can add to your laptop that use the USB port. For example, you can plug in a mini refrigerator into the USB port to cool a single can of soda at a time right at your work station. You can plug in Christmas light accessories and even little personal fans to keep you cool. There's even a pen holder out there that utilizes the USB port to monitor your use of RAM and CPU. Ladies, half the battle of accessorizing is making sure whatever bag we're carrying matches the rest of our outfit, right? Your laptop bag shouldn't be treated as some bulky thing that you have to tote around for functional reasons only. Instead, choose a cute bag that you're proud to carry your laptop in! Try to shy away from the backpack route if you're going for fashion – choose more of a messenger bag or briefcase style. These will also be the kinds of bags that will transition well from educational to business purposes (rather, they're suitable for college campuses and office buildings alike). Your laptop doesn't have to be just a boring piece of technology you carry around because you have to. Pimp it out and have some fun, show off your personal style and personality and get to work accessorizing the one thing you carry with you all the time! Alison Waters is a freelance writer who works closely with a company that specializes in network evaluation and implementation. She lives on her laptop, so it of course reflects her personal style accordingly! Do You Still Need a Photo Book? August 25, 2012 admin Comments Off on Do You Still Need a Photo Book?